The Nike Sportswear Gym Vintage Pants are made with a supersoft cotton blend for all-day comfort and lasting wear. LASTING COMFORT IN SOFT JERSEY FABRIC. A lightweight cotton blend feels soft and comfortable. An elastic drawcord waistband offers a secure, adjustable fit. Durable ribbed cuffs stay put. Ordered these and they were a little big. Washed them and the cuffs at the ankles lost elasticity and the legs shrank in length. They look like capris now. I'm heading out to return these! Very disappointed, especially for the price. They are also very thin fabric which means they will wear out quicker than the less expensive brands! I'm pleased with these pants! These are super comfy and soft pants and glad I bought them. The only downside is they pile up between the legs so I would recommend washing them inside out to hopefully prevent that. 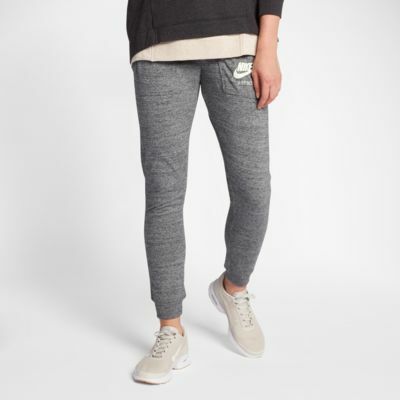 Otherwise cute pants to wear out or even just around the house.